What Facebook's new aerial drone could look like. Facebook will soon unveil an aerial drone as big as a Boeing 747 jumbo jet that will fly 24 hours every day. The company plans to fly the drones for months, even years at a time. This drone will to beam wireless internet access to unconnected parts of the world. The drone will be solar-powered, laser-equipped and will fly at an altitude of 20,000 meters or 65,000 feet. The altitude is above commercial airspace; a good place for drones to fly to avoid bad weather, winds and accidents. Facebook CEO Mark Zuckerberg joined forces with other major technology companies to bring internet to the two-thirds of the world that's still offline. Facebook, Ericsson, Nokia, Qualcomm, Samsung and others joined Internet.org for this very endeavor. 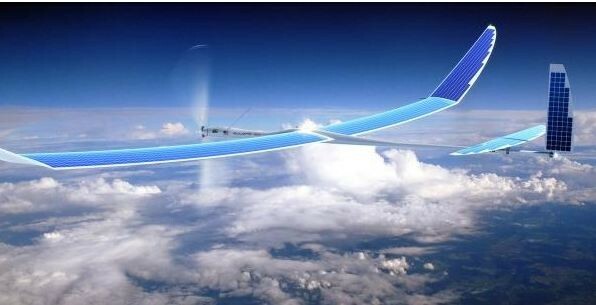 Yael Maguire, engineering director at Facebook's Connectivity Lab, recently stated the team hopes to get these drones in the air by 2015. They also plan to test it at a location in the United States. It's still up for debate whether they'll disclose the location. Actual internet broadcasts might take a while longer. Maguire eyes three to five years more for this to take place. Maguire adds they're taking a lot of risk by pursuing the project. Specifically, Facebook is taking regulatory risks because there really are no rules about flying planes outside of 60,000 feet. There are also no rules about beaming signals down to people. While Internet.org works on regulatory issues, Google is separately developing a wireless internet dissemination device using drones and balloons. The effort is called Project Loon. This project uses a large network of towers in the sky that receive internet access from antennas on the ground in one location and beam internet down to rural homes below. Regardless of who develops what, the internet will soon be a global phenomenon for all to use.